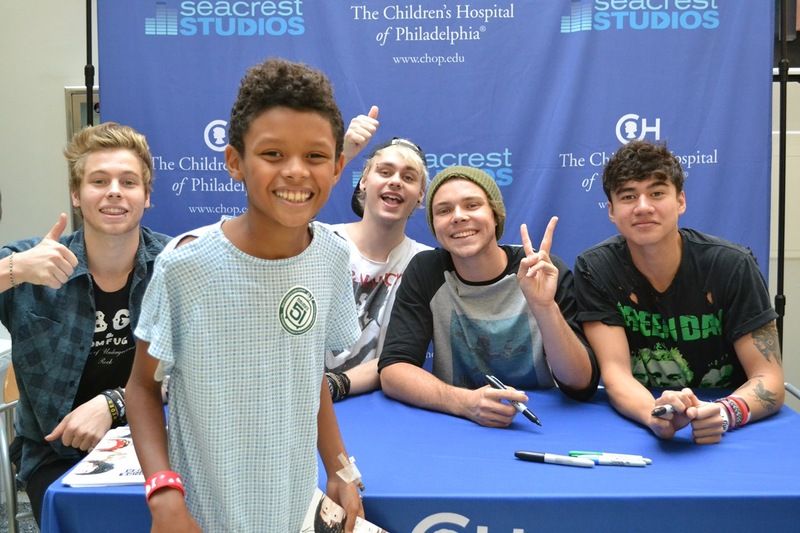 Recap By: Catherine Pearce, Seacrest Studios Intern Patients at Seacrest Studios were excited to welcome 5 Seconds of Summer to the Children's Hospital of Philadelphia for a patient run interview! Luke, Michael, Calum and Ashton, who are now on tour with One Direction, talked to us about everything from how they choose their name, to what is in the fridge on their tour bus. The group first started their career in Sydney, Australia playing in garages and singing covers of songs on YouTube. Since being invited to tour with One Direction the boys of 5SOS have been traveling around the country stopping to play two shows in Philadelphia. The guys admitted that since being here they have had about six cheese steaks and discussed with the audience their favorite places they have eaten in town. We chatted wih them about their band image with Luke saying "We definitely can't dance so that was off the table right away." They also mentioned that their favorite part of the tour is seeing every single fan having a really good time with lots of energy. 5SOS also gave us the inside scoop on all kinds of fun facts. For example on their tour bus you can always find the fridge filled with with chocolate milk and a never ending amount of M&M's. Ashton can do a very impressive Chewbacca impression and all the boys agree that Calum's mom makes the best spaghetti. As for the craziest thing that has happened on tour, Calum says it was the time he ripped his pants on stage. The guys were modest and grateful, "The fact that people would invest in us to make a video blows our minds." said Ashton. When we asked them how the name 5 Seconds of Summer came about Michael said, "There is no real answer. We came up with a name and never thought we would have to use it." 5 Seconds of summer has already announced dates for their headlining tour "Rock Out With Your Socks Out" kicking off in 2015! Best of luck to Luke, Michael, Ashton and Calum and thank you for stopping by to hang with us at Seacrest Studios!